The following rules outline the Mankato MoonDogs’ policies and procedures in the event that we have a game suspended or rained out. All fans can exchange their dated ticket for a ticket of equal or lesser value at a later date for any future MoonDogs regular season home game. This can be switched out at the MoonDogs office or ticket booth on the day of the future game you choose to attend. Fans holding a dated ticket can exchange it at a later date for a ticket of equal or lesser value to any future MoonDogs regular season home game. The MoonDogs will offer no refund of any kind. This is the universal policy for all patrons at all MoonDogs home games when a game is called off, for whatever reason, after it is ruled an official contest. Your Dog Pound ticket can be exchanged at a later date to a future MoonDogs regular season home game. 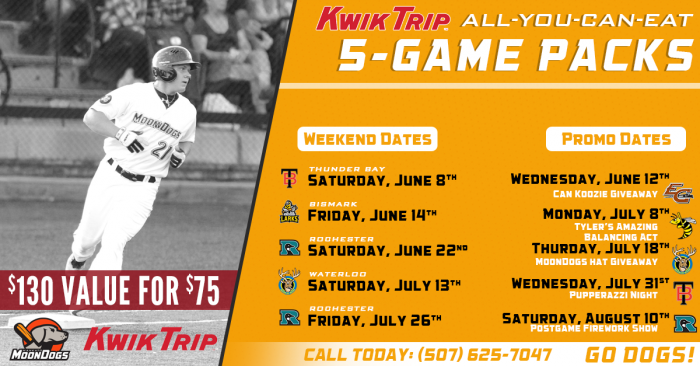 This can be switched out at the MoonDogs office or ticket booth on the day of the future game you choose to attend. The Mankato MoonDogs will offer no refund of any kind. This is the universal policy for all patrons at all MoonDogs home games when a game is called off, for whatever reason, after it is ruled an official contest. Under no circumstances will cash refunds be issued for games that are rained out. In the event that the last regular season home game of the season is rained out, vouchers for the next season will be issued to all of those in attendance.